In the foggy morning we drove east to Reliance, TN. It's a wide spot on Highway 30, just off US 411 in Polk County. 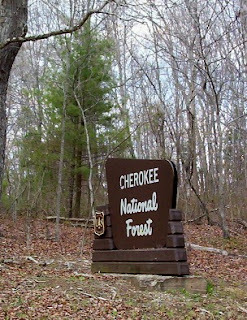 You enter the Cherokee National Forest heading down to the river. Beautiful even when the trees are bare--I'd love to see it in full green. We dropped my husband off with his fishing guide from Southeastern Anglers. 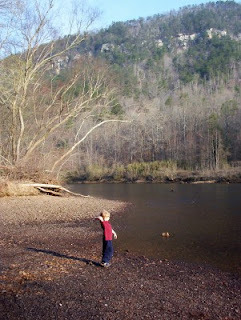 Then we stopped at the Hiwassee River Picnic Area for an hour or two of rock throwing. Talk about a kid in a candy store! 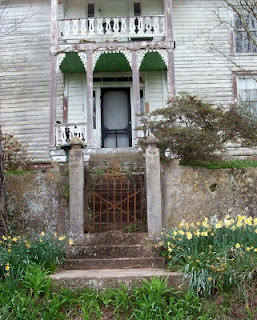 I daydream about old houses whenever we're out in the country. I think I may have found my dream house! I begged my husband to take some pictures on the way back. "Surely not that one!" my husband worried. No, the one down the street, directly across Hwy. 30 from the Hiwassee. Too bad it's already occupied. I asked the fishing guide. I love its stately frame and red roof. 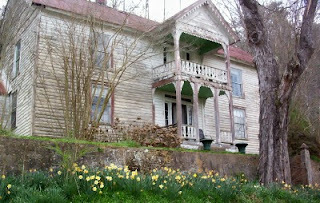 The yellow springtime blooms even give its shabby paint a cheerful glow. 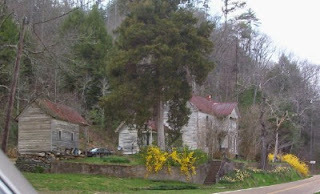 It reminds me of the "before" houses in Grace Livingston Hill novels. A close up of the handmade trim and rusted iron gate. You can see a touch of blue on the porch ceiling. Forget diamonds--daffodils are forever! I too, am a lover of old abandoned (or abandoned looking) houses! The two you posted are so pretty! I cam across your site some time ago but have never left a comment. I just started a blog myself...feel free to check it out! I love old homes! My hubby and I refurbished an old one as our first home! We've been away from it for eight years now. But I still miss it sometimes. I was ... well... older homes are just homey! OK, I always wanted to visit Tennessee, but now you really have me wanting to go! Ohio is closer than Colorado, so I might make it there sooner than I thought, since we just moved. Thanks for sharing! 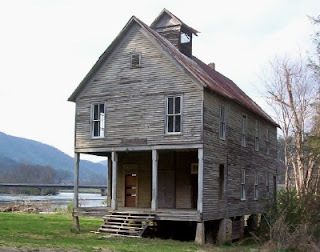 I've always enjoyed looking at old abandoned houses and barns. Oh beautiful! I love old, abandoned buildings & imagining their stories. Thanks for sharing the pictures. As a teen I rafted the Hiwassee each summer; it is a beautiful place. I remember sitting on the banks singing and having group devotionals. I was actually baptized in the river (the water was freezing!). Thanks for the lovely pictures and the memories! I love old houses. My dream is to move to the country and buy an old farm house. My great-great grandfather donated most of the land just outside of Newport...there are so many BEAUTIFUL homes that are just falling apart it makes me so sad!!! I love going to the river and throwing rocks....I too am like a kid in a candy store. The first time I ever took my husband HE FELL IN! It was hilarious!